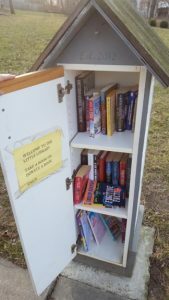 Inspired by the pictured Little Library located in nearby Ridgefield Estates, retired educators Bob and Susan Hiatt are spearheading a drive to bring this literary opportunity to Bridge Pointe. Over 50,000 Little Libraries have been constructed nationwide. The Bridge Pointe Book Station will be privately funded and located at the pool area. Little Library located in the neighboring Ridgefield neighborhood. Different designs are being studied and BP neighbor Jim Schnitz has volunteered to build the mini-library. Bridge Pointe neighbors will be invited to share adult, young adult, and kids books. The theme will be: Take a book–Leave a book–Or both. $5 contributions are encouraged and we hope to have the Bridge Pointe Book Station ready for the opening of the pool season. If interested in helping with this endeavor, contact Bob (816-305-4176) or Susan at (816-225-3556). Contributions can be placed in the Bridge Pointe mailbox located at the pool.